Teaching children literacy by using the sounds letters make speeds up their progress, a report says. Eleven-year-olds in Clackmannanshire, Scotland, who used the "synthetic phonics" method were three years ahead in reading. The local authority is using the technique in its 19 primary schools. A seven-year study by Hull and St Andrews universities also found pupils were on average almost two years ahead of others in Scotland at spelling. The report says: "It is evident that the children in this study have achieved well above what would be expected for their chronological age." It adds: "We can conclude that a synthetic phonics programme, as part of the reading curriculum, has a major and long-lasting effect on children's reading and spelling attainment." The pupils learned through the phonics system throughout their primary school years. Ronnie O'Grady, head teacher of Menstrie Primary School, said: "Teaching synthetic phonics gives children strategies for reading and writing that they wouldn't have had at the early stages using other methods." Half of all pupils in Scotland at present fail the national writing test for 14-year-olds. 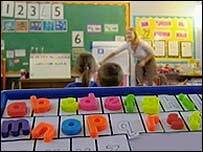 Education minister Peter Peacock has given his backing to the use of phonics in primary schools.